If you have explored this idea in Sage CRM you will probably have discovered that the peculiar structure of the phone and email screens means that the regular options for screen based rules are not open to us. The phone number table is invisible in Meta Data - it just doesn't appear in the list of Entities and the Email table only offers a single filter screen. There seems to be no place that we can put Create scripts, onChange Scripts and Validation scripts to manage phone and email details. And that is true. We can't use normal field level scripting with Phone and Email to ensure integrity. We will have to use some thing else. Before we start "hacking" it is worth reminding ourselves what validation there is in place already. We can see that there is some basic Email syntax checking that takes place clientside. This limited check ensures that a user is aware of any issue with an email address before it is saved - but it still leaves the final decision to the user. Note: This basic email check is absent when inserting a new Company and Person. The check is only relevant for updating email addresses. We would therefore need to check email addresses when the person or company is created. There is no check for the phone number. The phone number fields can take alphanumeric characters - a mix of numbers, letters and symbols like "-". 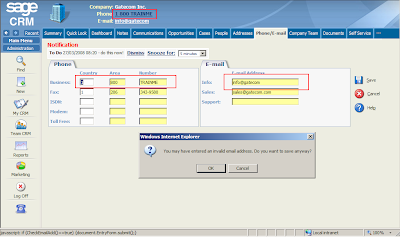 "Users can enter phone numbers in Phone Number fields in any format. CTI ignores all non-numerical characters and spaces when the hyperlinked number is selected by the user and dialed from CRM." So for CTI purposes we would only be left with "1800" as the number dialled. When entering a phone number the user should type the "simple" number—we can include spaces but it is best to exclude symbols. For example 44 161 5527789. If there is no Field Level validation script of the phone numbers how can we add a check? We can use an "Entity Level script with Rollback". Entity Level with Rollback scripts can be used when we want to stop an action happening if there is a validation error or other error with the script. The scripts are invoked from only the following standard CRM screens when the final save is clicked. The Values() and FormValues() collections are the mechanisms we can use in an Entity Level script to access data subittted from the screen. The Values() collection will allow you to access the data within the fields associated with the EntryBlock (screen) used to build the edit screen for the record. So when inserting a company a script created against the company that used the Values() collection would only be able to access the fields of the CompanyBoxLong screen. 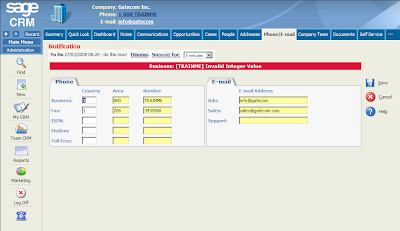 We can use FormValues() to access the telephone numbers and email addresses. 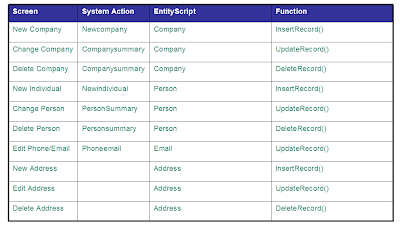 We can validate these as the Company and Person records are created using an InsertRecord() event function in an "EntityLevel script with Rollback". Also when we update Phone Numbers and Emails we will be able to use an Entity Level script with Rollback created for the email table. The check would need to be in the UpdateRecord() event function. Note: The example code below makes use of two helper functions to check the email addresses and phone numbers. These are added to the Entity Level script above the event functions. I have only given the InsertRecord() event function here. Although the other event functions are empty they should be left within the script definition. The helper functions would need to be included as the above example. This will now ensure that Phone Numbers may only be integers. I tested the above on SageCRM7c on the update record part on phone numbers. With entity level woth roll back, nothing happen. With table level, after saving changes to phone number, will have the expected error message BUT in person summary. The phone number is still saved with the wrong format. Would this same code apply to 7.1C? If i now edit a Person i get still a validation error which says that i have to put something in Mailaddress. How could that come? The person is linked to a company which have phone and mail, also the person has a phone number and email address. Ah okay i forgot that UpdateRecord Scripts should be added on E-Mail Entity Level script! Now it works as promised. Hi Jeff! Is your original advice - for v6.2 - still valid for 7.1 SP1 with the new changes? "When entering a phone number the user should type the "simple" number—we can include spaces but it is best to exclude symbols. For example 44 161 5527789." I have a client that wants to have dashes auto fill in the phone fields, as their ERP system does. In addition, they are looking to go to CTI in the future, so I don't want to put anything in place that would compromise that. Thanks. My advice would still stand. But it absolutely depends on the CTi system that you are using and the symbols that it supports. For example if you are using the QGate intelliCTi system to manage the integration of Sage CRM with your PBS then you need to check their documentation. I assume this script will NOT work with 7.2.f.1. I put it in place and it has no effect whatsoever. Can validation of emails and phones be done in 7.2? I have a client that wants to make some of them required. This does work! It works on Sage CRM 2017 R1 too. 3) Change the UpdateRecord event function to the code given above. The code will then work whether you are changing the email in the context of the company or of the person. I tried to use this code to prevent duplicated emails on persons. You need to make sure that you have code added to the correct Entity and that it is defined as an Entity Level Script with Rollback. The Event Function to use is the insert record NOT the post-insert event function.